Awarded the title as the first herb of invigorating Qi and strengthening spleen, no doubt Bai Zhu (Atractylodes macrocephala) lives up to that reputation thanks for its consistent performance. 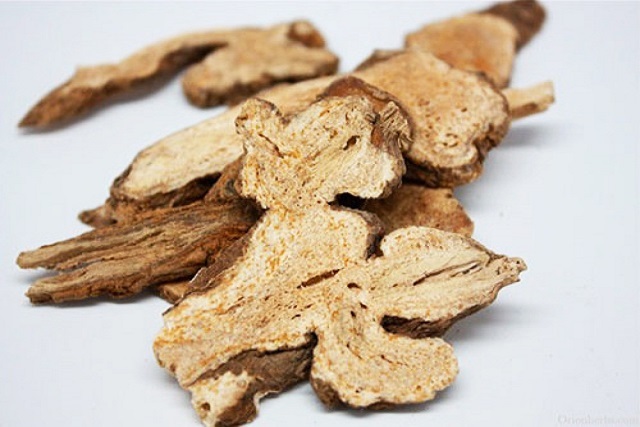 Given its special effect in Traditional Chinese Medicine (TCM), it is treated as an equal to Ren Shen (Ginseng). Thus an old saying goes: “Ren Shen in the north and Bai Zhu in the south.” Through the famous classic formula of Si Jun Zi Tang, Four Gentleman Decoction, a quick glance will be given to their significance. Just a quick footnote here, it is the fundamental formula for deficiency of spleen and stomach Qi, which is the inspiration source of numerous subsequent formulas aiming to tonify spleen and benefit vital energy. People use the root to make medicine. Atractylodes is used for indigestion, stomachache, bloating, fluid retention, diarrhea, loss of appetite, weight loss due to cancer, allergies to dust mites, and joint pain (rheumatism). Atractylodes is used with other herbs in TCM for treating lung cancer and complications of dialysis, a mechanical method for “cleaning the blood” when the kidneys have failed. Chemicals in atractylodes might improve function of the digestive tract and reduce pain and swelling (inflammation). From the TCM’s perspective, it is bitter, sweet, and warm in nature and goes to meridians of spleen and stomach. Main functions are to invigorate Qi and strengthen the spleen, eliminate dampness and promote diuresis, stop sweat, and prevent miscarriage. Main clinical usage and indications are lack of appetite due to spleen deficiency, abdominal distension and diarrhea, dizziness and palpitation caused by phlegm and retained fluid, edema, spontaneous sweating, and fetal irritability. Regular dosage is 6 to 12 grams.